Hi, my name is Victoria and I have the most adorable Pomeranian, Gia Marie. We always dress up together for Halloween. The past Halloween I wanted to be a little creative and I was inspired by making a homemade costume. The idea to create a Cabbage Patch Pom was inspired by kid’s homemade costumes and I grew up playing with cabbage patch dolls. 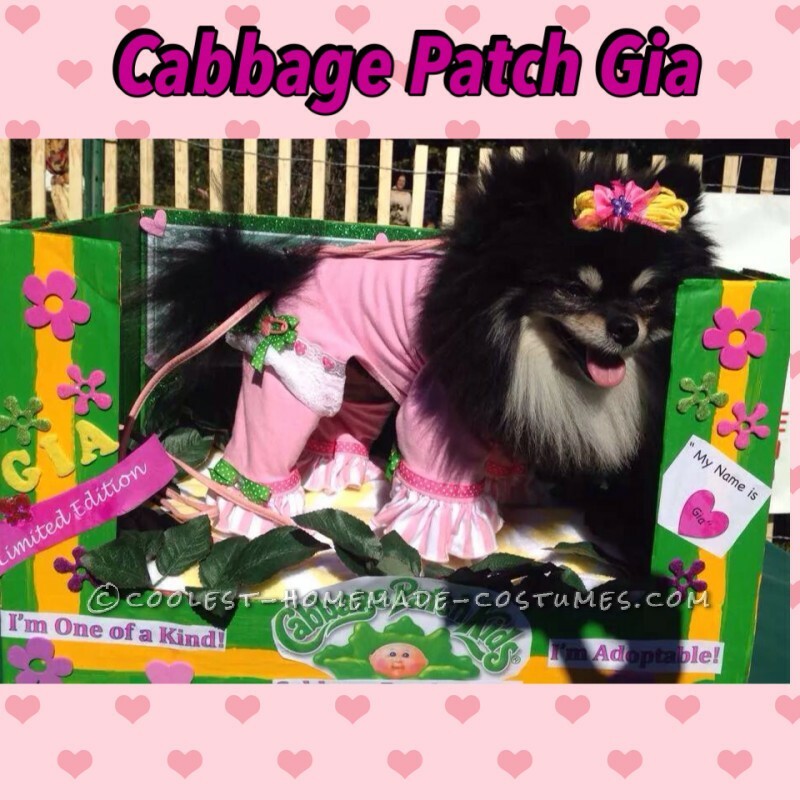 I knew my idea would be great because Gia was going to be the first Cabbage Patch Pom ever! 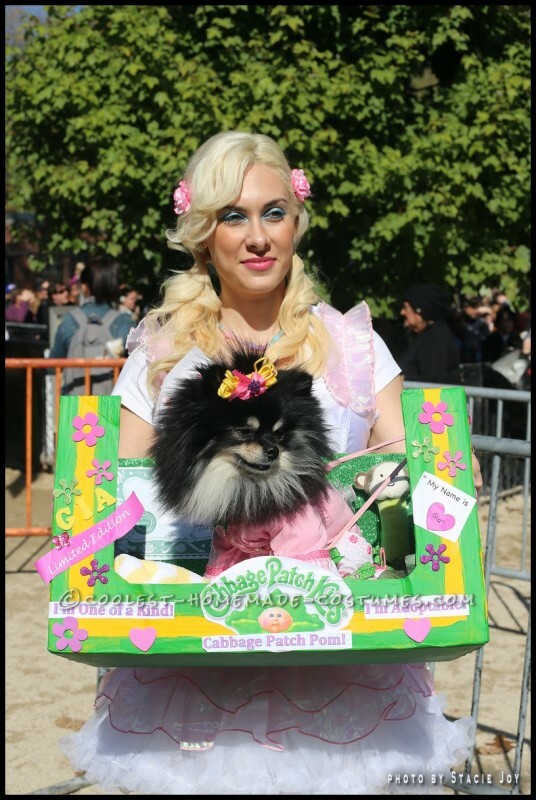 We attended the largest dog parade in NYC ( 24th Annual Tompkins Square Park) and we made a lot of great press but mostly importantly we put smiles on adults and children. Everybody loved Gia being dressed as a newborn cabbage patch baby and I was a dressed as a little girl! It was so much fun making the Cabbage Patch box. I found a box in my building, painted it the original colors and put the logo and created some fun logos such as Cabbage Patch Pom Gia. I even printed out an original Cabbage Patch birth certificate and put a pacifier and baby raffle in the box. Gia loved the box. It was super cozy! Her onesie outfit was homemade too! To create Gia’s blonde little hair, I wrapped up some yellow yarn and glued it together with a bow that had an alligator clip. 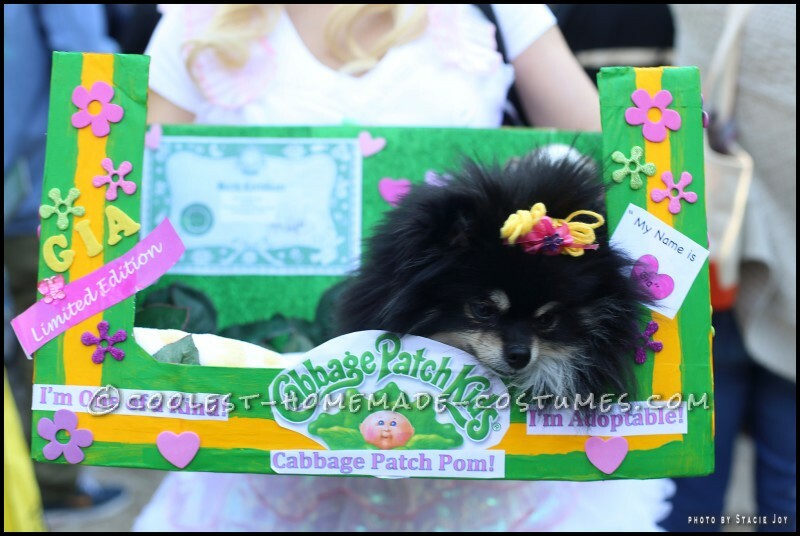 Cabbage Patch Pom is the most original for a dog’s costume and was so much for to make. Cabbage Patch Pom Gia rocked this costume and she smiled the whole time too!